Go along for the ride as Cornerstone Theater Company presents a world premiere adaption of Shakespeare’s The Tempest on an epic 10-city tour that begins later this month. 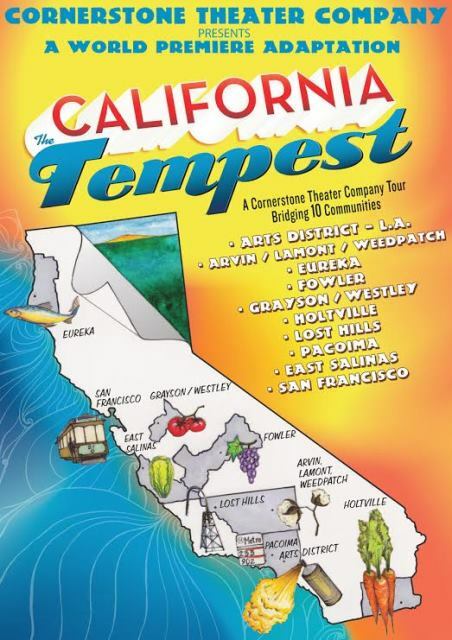 California: The Tempest, written by Cornerstone co-founder Alison Carey and directed by its artistic director Michael John Garcés, will travel to ten diverse California cities over the coming year. From the downtown Los Angeles Arts District to Arvin, Lost Hills, Grayson & Westley, Pacoima, Fowler, East Salinas, Holtville, Eureka, San Francisco and then back to Downtown LA (where it all began), each of these ten communities will contribute to writing the play they inspire. In each location, a community chorus will join the touring artists as part of the show. The journey will begin with two staged readings at Grand Performances in the Arts District of Downtown Los Angeles on August 22 and 23 at 8:00 pm. “What’s past is prologue,” as playwright Alison Carey’s adaptation of The Tempest meets California’s challenges head-on in this traveling experience that conjures love, disaster, revenge, forgiveness & music (all that you would expect from Shakespeare! ); mixed with earthquakes, drought, overdevelopment, food equity, state politics, fracking and immigration policy (all that you would expect from California!) as Prosper, her daughter Minerva, her servant Caliban and Californians from across the state yearn to find the commonality in our diversity and imagine a healthy and inclusive future for California. The core cast will feature Elzie Alexander, Karen Covarrubias, MC Earl, Gabriel Garcia, Iris Gonzalez, Chelsea Gregory, Brent Grihalva, Peter Howard, Joji Koyura, Page Leong, Francisco Martinez, Gema Sanchez, E’Vet Thompson and Bahni Turpin. The design team includes Nephelie Andonyadis (scenic design), Garry Lennon (costume design), Geoff Korf (lighting design), and Veronika Vorel (sound design). Original music is composed by Becky Dale and puppet design is by Lynn Jeffries. Holtville (Imperial Co) at Finley Elementary School. Click Here for information on the previews at Grand Performances, Downtown Los Angeles on August 22 & 23. The venue is free and no reservation is needed but you may RSVP on their Facebook page. To make a reservation for a tour performance, please call 1-800-578-1335.